Portland, OR— The United States Association of Cider Makers (USACM) released updates to its Level 1 Certified Cider Professional (CCP) exam this week. The updated test, official USACM cider style guidelines, and new preparatory materials are accessible on the association’s website. USACM has already certified over 400 people, and they anticipate surpassing the 1,000-person benchmark in 2018. The updates are designed to make the test more relevant to the target audience of the CCP program—the front line of cider sales. USACM members receive discounts on exam purchases. “We’ve removed much of the more technical cider making content and replaced it with material more important in the world of beverage and culinary professionals,” explained Michelle McGrath, USACM’s Executive Director. The updated exam sections are: (1) Apples, the Orchard & History (2) Cider Making (3) Flavor & Evaluation (4) Cider Styles (5) Keeping & Serving (6) Food & Cider. The ‘Cider Styles’ section follows the USACM cider style guide, which was released just this last fall by the association’s board of directors. The guide has already had a noticeable impact on the language used by the industry to describe the extensive variety of the cider category. CCP was launched initially in Portland, Oregon at the 2016 CiderCon, the association’s annual membership meeting and industry conference. The original visionary architect of the program was David Cordtz of Sonoma Cider. It was designed to be akin to the Cicerone program for the beer industry or the sommelier program for the wine industry. In fall of 2017, USACM added a working group of four industry professionals to help further develop the CCP program. The committee includes Jennie Dorsey of Schilling Cider, Eric West of the Great Lakes International Cider and Perry Competition, Brian Rutzen of The Northman and Eric McCrory of Angry Orchard. The committee taught an exam prepartion workshop at CiderCon 2018 in early February. The association is working with regional cider groups throughout the country to offer workshops in their areas. The goal is to help test takers gain the cider knowledge they need to pass and to be better cider stewards. Just this week, the Minnesota Cider Guild taught a workshop and purchased 50 tests for their cider community. The working group will rotate appointees on a biannual basis. The association plans to roll out levels two and three over the next two years. 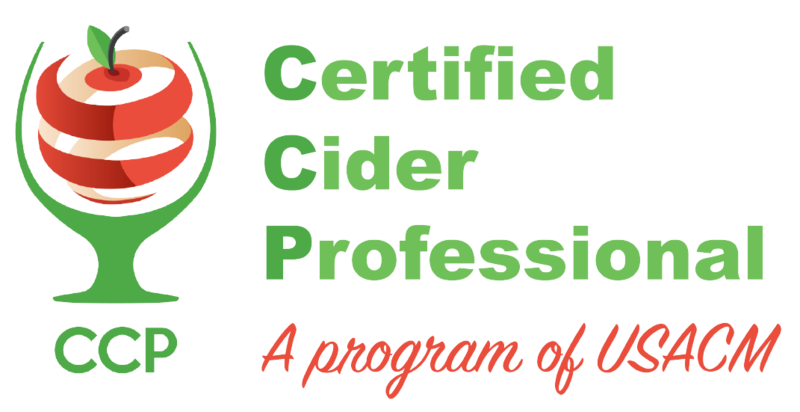 For more information on CCP you can visit the association’s website at www.ciderassociation.org/certification. Inquire with the association for bulk discounts on exam purchases.